I chose to make the shorter length jacket mainly because I like cropped jackets but also because if you look at that photograph on the pattern envelope there are drag lines from the side seam down towards the centre front which I figure had something to do with the length. The fabric is the real superstar of this project though - it's a vintage wool tweed piece I bought from the remnants table at the Remnant Warehouse earlier this year. The base colour is a beautiful peach shade, with flecks in varying colours. It sewed and pressed like a dream. The other feature I used is a vintage button I bought from an aptly named shop called Buttons Buttons Buttons down in The Rocks (a tourist district in Sydney) - I bought three of them years ago for a failed project (another *cough cough* UFO) but I decided it looks better on this project. It really is the centrepiece of the jacket front, and acts like a brooch so I tend to keep my accessories with this jacket very simple. The other feature I really love about this pattern is the inseam buttonhole which you can see in the photograph above. It's such a neat finish and of course saves the stress of doing a neat buttonhole. The only other change I made was with the button placement on the front. 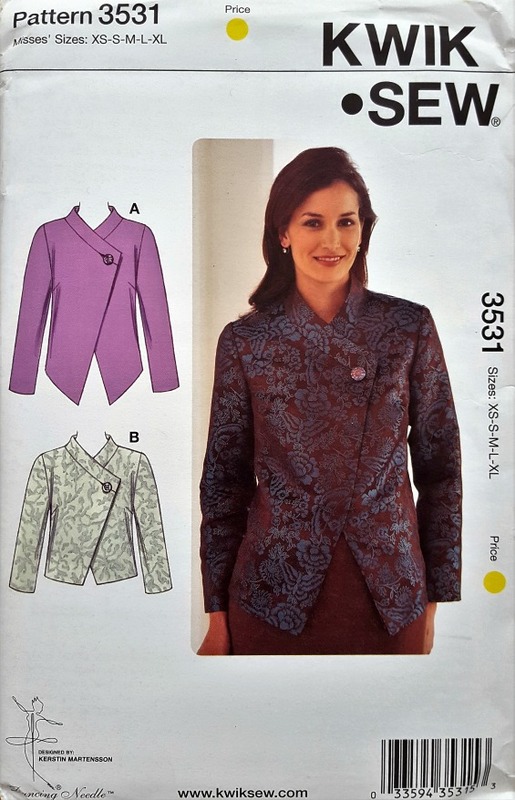 I chose the button placement when I was wearing the jacket and just where the fronts sat best - my buttons are a bit lower and more towards the centre than where they are indicated on the pattern. And looking at these photos I can see that I've put the outside button on the opposite side to the pattern, oops! I'm sure there's some convention about which side women's jackets are supposed to button up, but since I made this and no one else will be wearing it, it suits me just fine! 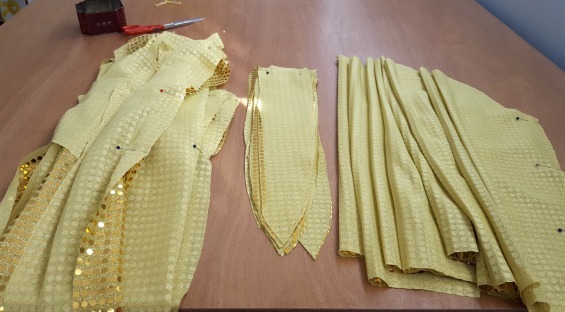 Although my fabric has a weight suitable for a jacket, I used some iron on interfacing on the neckbands, facings, part of the fronts, upper back and sleeve heads for extra structure. So overall I can highly recommend this pattern if you're looking for a simple and easy to make jacket. Because there isn't a traditional notched collar needing traditional tailoring techniques such as pad stitching along a roll line or welt pockets it comes together very quickly. I've already worn this jacket several times to work since I made it a few weeks ago and I've received quite a few compliments on it - clearly a winner! 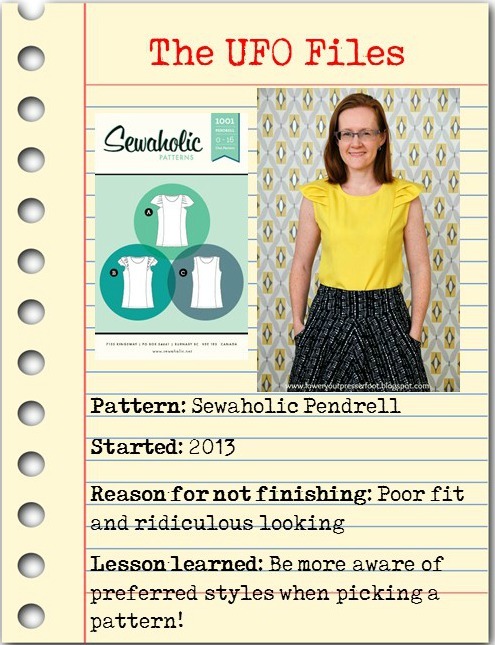 Completed UFO#4: possibly the last sewing blogger to make the Sewaholic Pendrell? Some long time readers may be a little surprised at seeing me sew an indie pattern given I've barely disguised my disdain for the majority of indie patterns in the past. But this project was a long term UFO, and I didn't even buy this pattern in the first place so I can reassure you that I am not about to become an indie pattern fan girl anytime soon. Back in 2013, a lovely reader (who in one of those isn't it a small world kind of coincidences lives close to where I grew up) sent me two Sewaholic patterns that she no longer wanted (hi Reona! thanks again!). I had plans to make the Cordova jacket immediately, but couldn't find a separating zip in a colour to match my chosen fabric and then I used that fabric for something else so as result I still haven't made that pattern. Admittedly, a bright yellow colour probably didn't help but this fabric is lovely - a lightweight wool that drapes wonderfully and for some reason I'm really drawn to yellow. 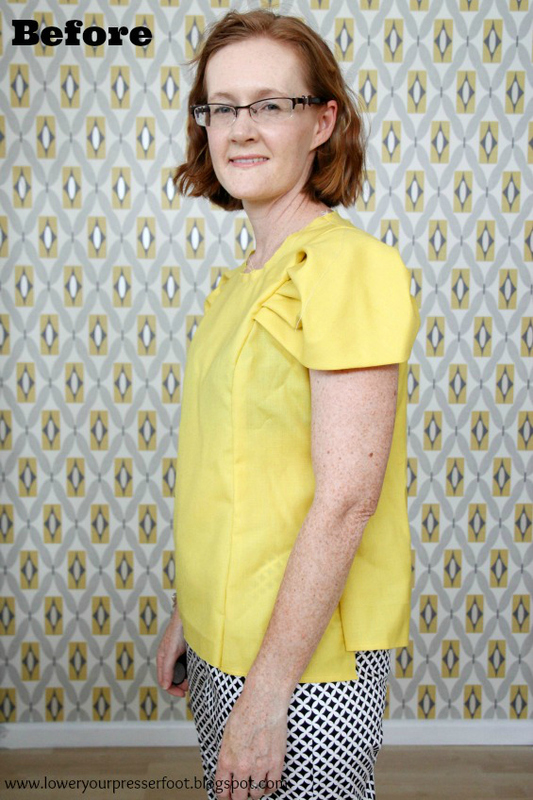 This fabric actually came from a maternity top I made back in 2008 that I couldn't bear to get rid of so I decided to refashion it into this top (hence the uneven hem in the photo above). 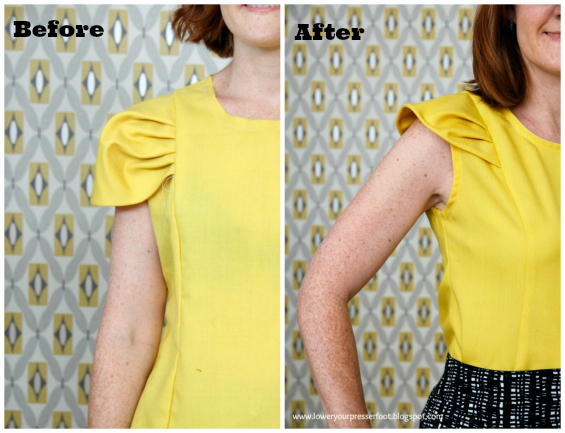 I really should have known better about those sleeves before I started making this pattern - I have narrow shoulders and prefer a neat and close fitting garment, anything too wide or fussy around the shoulders makes me feel like I'm wearing something too big. So I did what I normally do: unpicked half the seams, got annoyed and stuffed it into my UFO box to marinate until the time was right. So the first fix was to those ridiculous puffy sleeves. 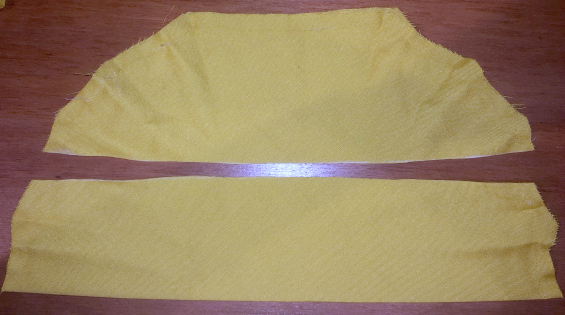 I thought the top looked too plain without a sleeve, so I cut the original sleeves in half horizontally, keeping just two pleats. 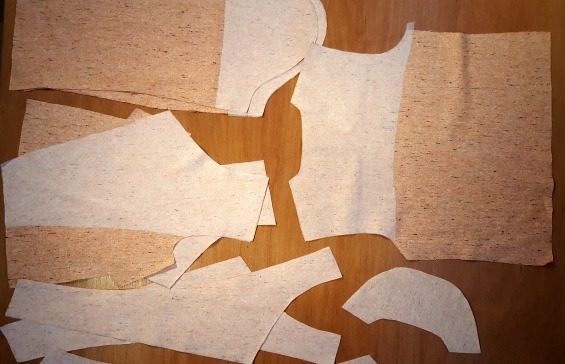 This way I kept a pleated cap sleeve but without the excess volume. The second fix was to get a closer fit. I know everyone else seems to like their versions, but I seriously do not understand why a pattern would be designed with princess seams front and back but instead of using those seams to achieve a close fit it instead needs to be loose because there is no opening in it. It may as well as been a single piece for the front and back with a few bust darts instead. Rant over - I know I prefer a closer fit than some other people do. And now that I had an opening in the back, I then took in each of the side seams and princess seams gradually until I got the closer fit that I was after. I didn't make it too tight though because this fabric has no stretch and obviously I still needed to move in it. So after all that work am I happy with it? Mostly, but it's not my favourite. I'm not a fan of using bias bindings at the neckline, I think a facing is a neater finish. 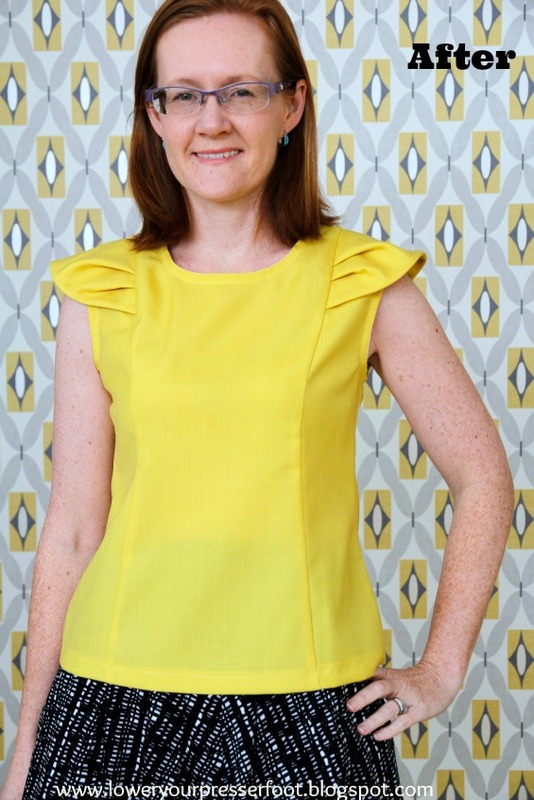 I also have lots of other closely fitting shell tops that I wear repeatedly but I do like the yellow with black and white and grey outfits so it will definitely get worn. 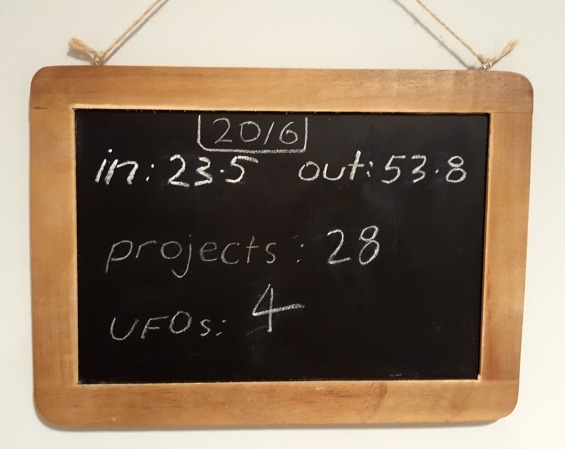 And that's another UFO out of the box and into my wardrobe! Can you see how much fabric I've used this year compared to how much I've bought? That's what I call winning! Of course it doesn't make a dent in the extensive fabric stash I already have, but I'm slowly edging ahead in my twisted fabric stash mathematics. 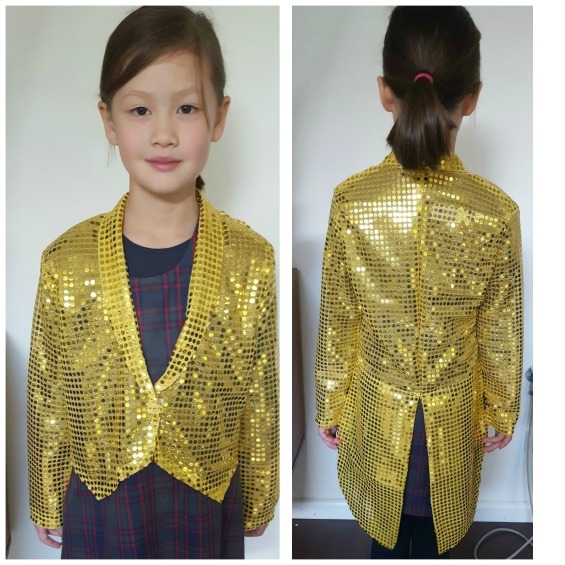 And those statistics do not include the 39 metres of gold sequin fabric I've spent the last few weeks making into 28 jackets. This jacket looks a little large on Anna because the jackets are made for the older kids in her school - I have no idea how well they fit the kids I sewed them for though, and frankly I don't care anymore!